I don't even know where to begin. Except to tell you that Susan May Warren has done it again... The Shadow of Your Smile is simply wonderful, and this is a book I most definitely recommend. Especially to any woman who is in that roughly 40something age range (like the heroine of this story), as there is just so much that you can relate to. A beautiful blanket of snow may cover the quaint town of Deep Haven each winter, but it can’t quite hide the wreckage of Noelle and Eli Hueston’s marriage. After twenty-five years, they’re contemplating divorce . . . just as soon as their youngest son graduates from high school. But then an accident erases part of Noelle's memory. Though her other injuries are minor, she doesn’t remember Eli, their children, or the tragedy that has ripped their family apart. What’s more, Noelle is shocked that her life has turned out nothing like she dreamed it would. As she tries to regain her memory and slowly steps into her role as a wife and mother, Eli helps her readjust to daily life with sometimes-hilarious, sometimes-heartwarming results. But can she fall in love again with a man she can’t remember? Will their secrets destroy them . . . or has erasing the past given them a chance for a future? Read the story behind the story here. I'll confess, I read that and rolled my eyes a bit. Amnesia? Puh-lease... I don't watch soap operas, never truly have, and I don't want to read them either. But as I mentioned before, Warren is an author I love... and this one takes place in Minnesota... so I went for it. In spite of the lame amnesia bit. And it was so easy to "become" Noelle. You know, mid-forties, waking up in a hospital thinking you are a 21 year old student at the U (that'd be the University of Minnesota. The one in the Cities, just to be clear.) and being a bit intimidated by this old dude claiming to be your husband, and also the adult and near adult men claiming to be your sons. Craving a sub from Big Ten (and so, naturally, I have been craving Big Ten subs ever since. Thanks, Susie. I needed a craving I can't fulfill.) and worried about why your parents haven't been called or whether or not you are going to miss class. Noelle tries to settle into her not-remembered life, interacting with her sons and her husband... all of that is absolutely fabulous. But of course, with a Susan May Warren book, that's not all. There is the plot involving her oldest son, or the plot involving the robbery that landed Noelle in the hospital to begin with. Or the plot involving her husband and "another woman." Layers upon layers, all incredibly well-written, involving people who feel real, and definitely describing real snowstorms and real places. If you have read My Foolish Heart, there are even a couple of appearances of characters from that novel. This title stands alone, however. And I think this one is better (and I really enjoyed My Foolish Heart!) I think this is a complete must-read for anyone with Minnesota ties. But I also highly recommend it for people with no connections to the area. You won't have the same thrill of picturing exactly the apartments being talked about... and you may not enjoy her incredibly real description of driving in a snowstorm... but the basic storyline is "place-less." You can read what other bloggers thought of The Shadow of Your Smile at the LitFuse page... or just head to Amazon and buy it. Sometimes love requires a little forgetting ... Come back to Deep Haven and find out what's been happening in your favorite quaint hamlet. If you're new to the Deep Haven series - this is the perfect book to start with - each book in the series is a stand alone story. 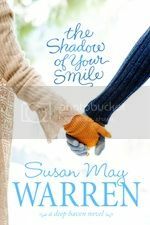 Susan is celebrating the release of The Shadow of Your Smile by giving away a prize pack worth over $200 from 1/9-1/28. The winner will be announced on 1/30/12 on Susan’s blog, Scribbles! Just click one of the icons below to enter and tell your friends about Susan's giveaway on FACEBOOK or TWITTER and increase your chances of winning. I love Susan May Warren. This one looks good! Sweet, sweet photo you have!!! My baby is almost 26... the years pass by so quickly; don't blink! "Blogging book reviews?" I agree! I liked your review! I haven't read the Deep Haven novels. This sounds like a good one, and no, I don't relish driving in a snowstorm!! The wonderful scent of clean air afterwards, hushed and quiet, is something you can't describe if it hasn't been experienced.